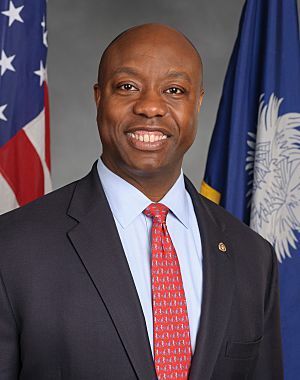 Tim Scott (born September 19, 1965) is an American politician. On January 3, 2013, he became the junior U.S. Senator from South Carolina. He was in the U.S. House of Representatives from 2009 to 2013. Scott was born on September 19, 1965 in North Charleston, South Carolina. He attended Presbyterian College. Scott graduated from Charleston Southern University. He is unmarried. Tim Scott Facts for Kids. Kiddle Encyclopedia.